The fiery bite of cayenne pepper can make food sing with flavor, but did you know that this dried spice also has many practical uses around the house? Here are the top seven ways you can put cayenne to work around your home. 1. Protect your bird feeder: According to a plant regulatory officer from the West Virginia Department of Agriculture, birds are immune to the sting of chili peppers, while mammals are most certainly not. By adding a little cayenne to your bird feed, you can ensure the food goes to the birds, while bullying squirrels are kept at bay. 2. Get rid of ants: Ants are insidious creatures, exploiting any opening in your home to get at your food. Try cayenne pepper for a natural ant control solution. 3. Curb kitty’s curiosity: Cats are fiends for cables and cords. The mere sight of a power cord or a pair of headphones can set them to “kill mode.” If you’d like to cure a curious cat's chewing habit, rub a raw, sliced hot pepper on your cords, or whip up a quick hot sauce by dissolving ground cayenne in vinegar. Apply to dangling cords regularly to protect them from kitty’s wrath. 4. Protect your garden: If rabbits and rodents are chewing through your garden at night, you can protect your plants with a simple mixture of cayenne and water. Fill a spray bottle with the mixture and keep your plants coated, sending Thumper to your neighbor’s yard in search of a free meal. 5. 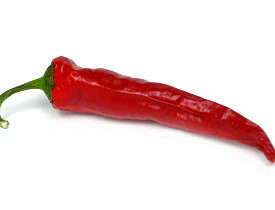 Reduce joint pain: Capsaicin, the burn-inducing substance in hot peppers, is also a powerful anti-inflammatory agent. Topical application of capsaicin may ease achy joints caused by arthritis. 6. Cure scaly skin: According to the National Psoriasis Foundation, over-the-counter capsaicin cream can help reduce itching and skin inflammation caused by psoriasis. 7. Lose weight: Although we don't officially endorse it, quite a few celebrities have lost weight quickly for film roles by subsisting on a diet of cayenne pepper "lemonade" and water. Some studies claim that cayenne works as an appetite suppressant. As with all herbal remedies, check with your doctor or a reputable homeopath before using cayenne pepper remedies.